We take great pride in designing products that provide the highest level of accuracy, reliability and ruggedness. All Vantage Pro2 stations include a console and a versatile sensor suite that can be customised by adding consoles or special-purpose options. 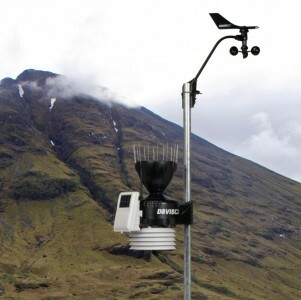 The anemometer can be mounted separately from the rain collector. The display console keeps you up to date on all the current information, as well as providing historic summary and forecast data. You can get this with an economic cabled connection to your weather station, or wireless for greater siting flexibility. Rain - View daily, monthly or yearly rain totals, as well as rain rate. Graphs - graphs the last 24 hours, days or months for any variable. The Integrated Sensor Suite combines the rain collector, temperature and humidity sensors, anemometer, UV, and solar radiation sensors into one package. You can customise your Vantage Pro2 Plus to suit your needs and microclimate. Combination Wind Speed & Direction sensor - Rugged components stand up to hurricane force winds, yet are sensitive to the slightest breeze. Wireless/Cabled - options for both cabled or wireless connection to the display console. The cabled option is the most economical while the wireless option is more expandable if you wish to add additional remote station. The cabled option is also more vulnerable to lightening damage or power surges if this is a concern at your site. Solar Panel - Energises the station during the day and charges a super-capacitor for night time operation. Lithium backup battery provides extra power if needed. Easy Installation- Installs easily and quickly with enclosed installtion hardware. Suitable for mounting on poles or posts. Mounting pole or tripdod additional options.